The Arkansas Derby is the last major Kentucky Derby prep of the year, and this year's edition has shaped up as a strong one. That's nothing new in recent years. Most notably, Triple Crown winner American Pharoah made his final preparations for his trip into history here in 2015. The next year Creator won this race and the Belmont. And, looking further back, we have seen other big success here. In 2004, Smarty Jones won here, and then won the first two legs of the Triple Crown. The next year Afleet Alex won here and the last two legs of the Triple Crown. And two years after that, Curlin won the Preakness on the road to a legendary career. Improbable (8/5): Bob Baffert already has two likely Derby favorites in Roadster and Game Winner, and he is in good shape to have a third here. This colt has 25 Derby points, so a third or better will likely get him to Kentucky. And he is certainly good enough to do better than that. He won his first three races last fall, capped by a runaway win as the overwhelming favorite in the Grade 1 Cash Call Futurity. He was out of action for three months and showed some real rust in his return in the Rebel Stakes. He looked good for the most part but was caught at the wire by Long Range Toddy, a horse that had no business being on the same track as him. There is a very interesting jockey change here. Drayden Van Dyke had been aboard, but Jose Ortiz has taken over here. That's a massive upgrade, and an odd one - Ortiz has never ridden for Baffert and has an embarrassment of Derby options. This is an eye-opening move and another reason to like this horse. He looked like he needed that last race, and he has worked well since. I'm a believer. Omaha Beach (2/1): This is an interesting horse. It took him a long while to find his form - he failed to win in his first four maiden races, finishing third once and second three times. But in early February he finally got it done at Santa Anita. And then he headed to the Rebel and pulled off an upset win in the leg that Improbable wasn't in against Improbable's stablemate Game Winner. He showed tremendous heart fighting back to win narrowly in that race. And that result creates a lot of interesting drama here. This colt is ridden by Mike Smith. 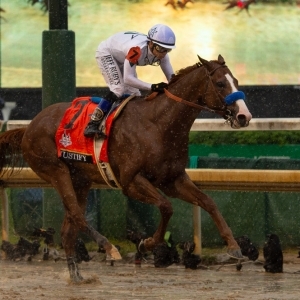 He not only famously won a Triple Crown with Bob Baffert on Justify last year, but he also rides Baffert's Roadster, the current futures pool favorite for the Derby. So, he is facing a star of the Baffert stable here after beating a star of the Baffert stable last time out, then Smith will have to choose between this horse and a star of the Baffert stable. This colt has shown a lot lately, and he has another advantage. He broke his maiden on an off track, and the forecast for Saturday is for rain. That could help him. On his best day, though, I don't think he is quite good enough to beat Improbable if the favorite is in form. But then I will fully admit I am a Baffert guy, and this horse is trained by Richard Mandella - a very good trainer, but one who has never won a Triple Crown race. We are in Baffert's playground here, and that's difference enough for me. Long Range Toddy (5/1): This colt got that shocking win over Improbable last time out. It seemed to come from nowhere, but it was a solid effort, and he has improved with every time out of the gate. It is hard to imagine that there is enough upside here, but he just keeps hanging around, he likes the track, and Steve Asmussen is better at training winners than any living trainer. I'm a cautious skeptic here. He already has 53.5 Derby points, so win or lose he is likely heading to Louisville as long as he stays healthy here. Gray Attempt (8/1): This is an odd story. He won the Smarty Jones early this year to announce his presence. But then he had an awful trip in the Southwest and faded badly. Instead of trying again in the Rebel, he instead dropped into a listed sprint stakes race. He won impressively, and now he's back here. Did he get his mojo back? Or is he just not up to this level of racing? The one thing we know is that he will be mixed up in the early pace. Galilean (10/1): Making his major stakes debut last time out in Improbable's division of the Rebel, this colt got mixed up with the early pace but still held on to finish third. They have taken his blinkers off this time, which likely means they want him to rate more off the pace. He could be a part of it, but I question if he is good enough. Country House (12/1): This Bill Mott colt is one I have been intrigued by. He has 30 Derby points right now, so he is likely just outside the Derby bubble. He was a strong second in the Risen Star but then was a disappointing fourth in the Louisiana Derby. He's well-bred and I like the connections. While he needs to improve to be a factor here, at this price he will be a part of my exotics for sure.